Tulsa Council of the Blind: NEW LEAGUE IN OKLAHOMA! short summer league to acclimate folks to league bowling followed by a 15-week winter league. We feel we have some good competitive bowlers. Sheridan Lanes 3121 S. Sheridan in Tulsa, OK, every Saturday morning. We started with six bowlers and now we have ten and are expecting to grow. 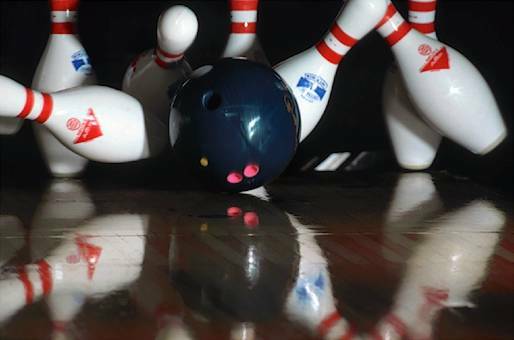 Photo of bowling ball striking pins. wanting to open bowl. We started bowling once a month, and then it became every other week and finally, it was every week. So, my husband and I talked to the others about starting a blind bowling league and joining ABBA. When we went to Reno last summer 2011 for another convention, we met another couple who were members of ABBA and that encouraged us even more. Now we're here to make a name for ourselves, have fun, and make Oklahoma proud!